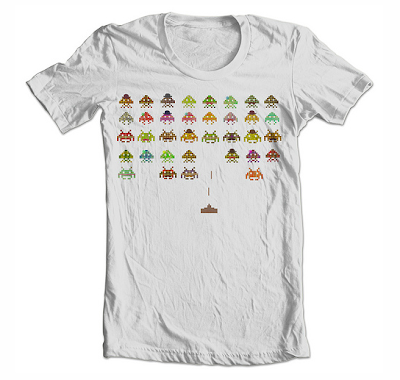 What do you get when you put bowler hats and mustaches on the iconic creatures that inhabit Taito's classic arcade game, Space Invaders? Why, you get "Swank Invaders." Duh! That's not the official title of the awesome t-shirt design seen below--which was created by Toronto-based illustrator Terry Fan (aka igo2cairo)--by the way. As of this morning, Fan was still calling it "untitled," so I thought I'd help him out a bit. Unfortunately, "Swank Invaders," or whatever Fan winds up calling this design, isn't being sold anywhere (such as through Society6 or threadless) at the moment, although I'm hopeful it will be soon. In the meantime, check out more examples of Fan's work by clicking on the links above and by paying a visit to his Flickr photostream, his website or these previous blog posts. Hello, Triseratops! It is clever, isn't it? It'll be interesting to see what name/title Fan himself decides on for it. Anyway, here's to hoping t-shirts bearing this design are made available soon! Love this!!! Oh my gosh.